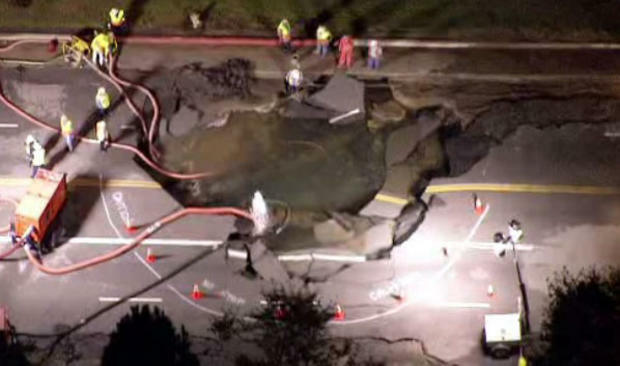 The UCLA Campus and classes reopened today, but it is still in need of water damage restoration services after a pipe burst shot a 30-foot geyser through a 15-foot wide sinkhole on Sunset Blvd in front of the University of California Los Angeles. 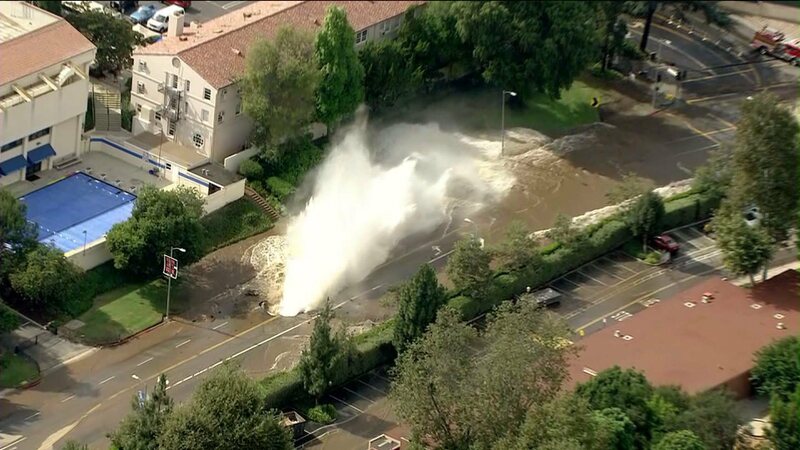 The incident occurred around 3:30pm on Wednesday July 30th between Hilgard Ave and Veteran Ave. Sunset is still closed, along with the UCLA summer camps and childcares while water damage Los Angeles companies take on the monumental task of restoring UCLA. LADWP has made sure not to interrupt water service for local residents and the water is still safe to drink. 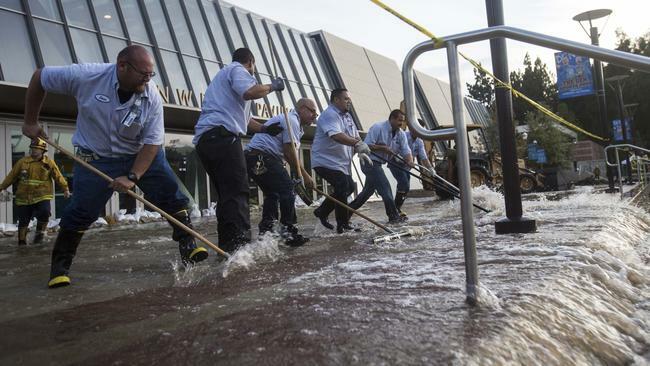 No injuries occurred directly from the flood, but two workers were hospitalized and four treated at Pauley Pavilion after inhaling carbon monoxide, likely resulting from sump pumps and other machinery used to clean up floods by water damage Los Angeles professionals. When water emergencies occur, especially on this scale, the need for a professional water damage Los Angeles crews is apparent. Whether you are running a school, major cooperation, or a small start up, always have your plumbing checked with a free inspection and protect your assets with flood insurance. The blame for this pipe burst is being placed on the age, as the water line was 93-years old. It is likely the plumbing under your building is just as old. Remember, water damage can happen to anyone. Let Pauley Pavilion be a warning and act now to protect your property by calling water damage Los Angeles experts to assess your risk. Pauley Pavilion is the basketball court for UCLA where crews recently finished a $136-million renovation project in 2012, as reported by USA TODAY. Unfortunately, this is one of the hardest hit areas and the floorboards have begun to buckle and warp. In an effort to stave off the water damage, sandbags had been placed, but they did little good against millions of gallons of water. As of Wednesday night, the arena floor was covered by 10 inches of water, no doubt draining into crevices and causing mold, yet another problem that should be left to the water damage Los Angeles teams to avoid health risks. When Zach Cohen of 911 Restoration was asked for his professional assessment of the Pauley Pavilion flood he said the most important thing to do now was develop a strategy to extract the water quickly and safely without it manifesting into mold. Parking Structure 4 and 7 are closed for a good reason; approximately 740 cars have been claimed by water damage. While some may be salvageable, many more are not. It is unclear who will pay for the damages between LADWP, UCLA, or private insurance companies. If your vehicle was in one of the parking structures, you can fill out an online form on the UCLA website describing your car and they will provide you with information. When major plumbing separates at a “Y-juncture,” such as what has happened at UCLA, preventing lasting damage is almost impossible. Luckily, this is a fluke and there are many ways to protect your property from smaller occurrences such as a toilet overflow or ruptured hoses. Sump pumps remove water if it does make it into your building. A sewage back flow valve will halt returning water from spilling into your bathroom. Cleaning gutters can eliminate the chance for rain leaks if it ever storms in Los Angeles. There are many other tips and tricks that you can learn from water damage Los Angeles specialists. If you find yourself faced with catastrophes as large as the UCLA flood, the best thing to do is call the professionals as soon as possible. The faster they arrive, the less damage your business sustains. While LADWP and the upper management of UCLA pulled their hair out trying to resolve this emergency, the students had a good laugh, even using some of the flooded stairwells as swimming pools. This looks great in photographs and squelches the Southern California summer heat, but it could lead to serious disease and should be avoided. The water flowing from the pipe may have been clean enough to drink, but by the time it flowed over the grass field, well-tread walkways, and trampled halls, the pools have collected enough dirt and debris to put students in the hospital. Any open sore could become infested with a number of parasites. 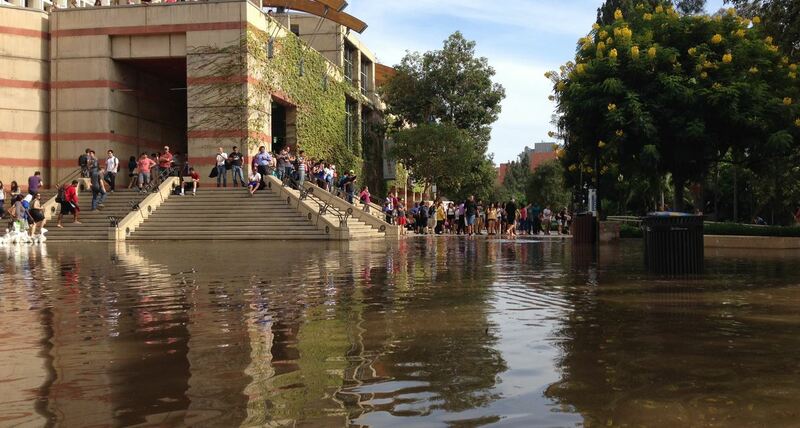 If you are a student at UCLA, stay out of the water. In addition, many students were attempting to skim board over the surface yesterday. This is a sure way to end up with a face full of asphalt when falling off the board. Leave all interactions to water damage Los Angeles personnel. HOW MUCH WATER WAS LOST? 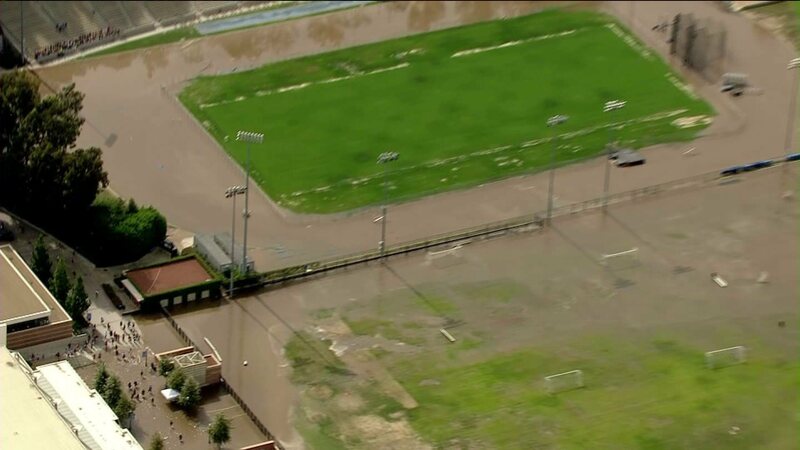 Nearly 20 million gallons of pumping water flooded the college, with about 4,000 gallons a minute at its peak. To put that in perspective, Los Angeles uses approximately 550 million gallons in one day. This pipe burst increased water usage by about 4%t. An average household uses about 129 gallons per day, which means one person could live on this flood for 424 years. Monetarily, the average rate for water is $1 for 150 gallons. Therefore, the event cost $133,000 in water usage alone. To look at it another way, there are three to four breaks a day, but rarely do they reach this magnitude. Most of these instances are due to age, as so much of the plumbing system was installed during the 1920s in Los Angeles and 1950s in San Fernando Valley. 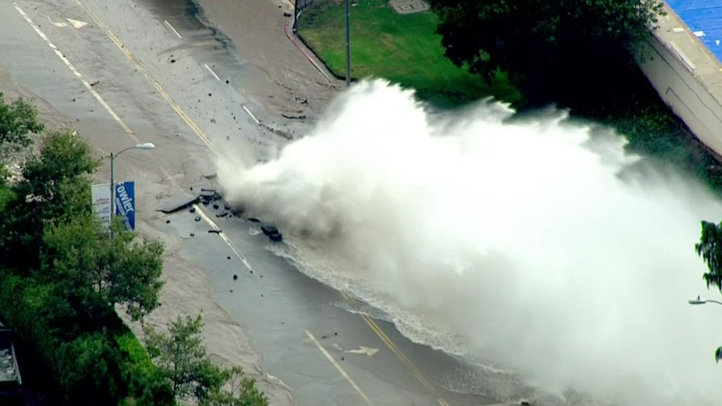 Los Angeles citizens can expect many more floods of this magnitude because it will take 300 years to replace all the pipes in the county. The alternative is just as baffling. In order to drop the project to a one century timetable, $4-billion would have to be allocated for that job alone. In the end, the situation comes down to the great debate of money versus time. 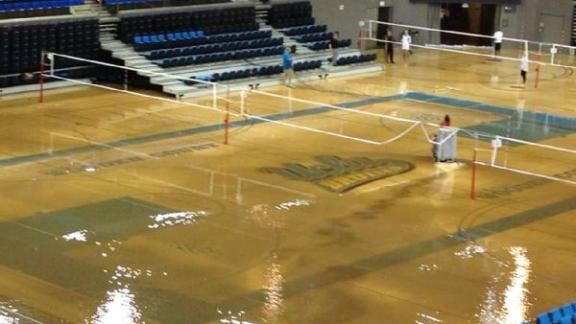 It looks like UCLA will be spending both resources to bring their school back to perfection. You can avoid many floods and leaks by speaking with water damage Los Angeles staff and learning who to protect your property from disaster.